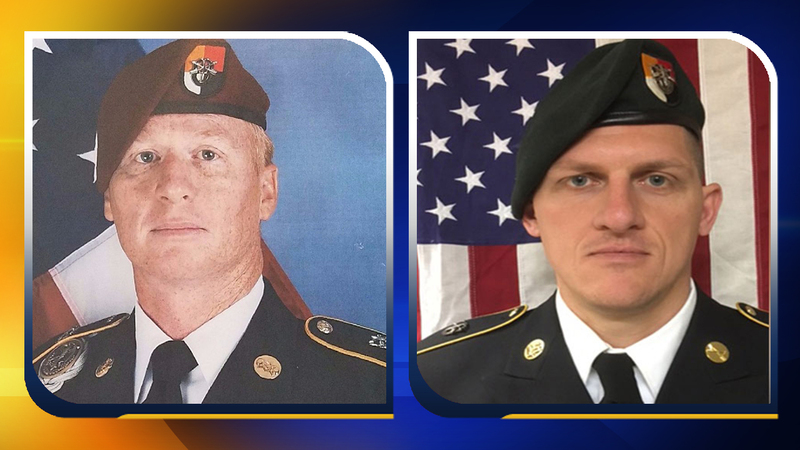 FAYETTEVILLE, North Carolina (WTVD) -- Two soldiers who were killed in action in Niger on October 4 will be returning to Fayetteville, according to Jernigan Warren Funeral Home . Staff Sgt. Bryan Black and Staff Sgt. Jeremiah W. Johnson were escorted by motorcades from RDU to the funeral home in Fayetteville on Monday. Black's family will have a wake for him on Tuesday from 6-9pm at Jernigan-warren funeral home and it's open to the public. They also ask that anyone willing to show their support to come to the funeral at the Northwood Temple Church, located at 4250 Ramsey Street Wednesday. The service will start at 2:00 p.m.
Black will be laid to rest at the Arlington National Cemetery on October 30. Johnson's family will have a private wake for the soldier on October 19. In lieu of flowers, Johnson's family requests that donations be made in his name to the Special Operations Warrior Foundation.